A huge part of functionality lies among applications such as the efforts to prevent spamming or sending emails safely. Similar to other computing languages, PHP has also introduced its own API library and as an example, you can take cURL. Since PHP is one for the best web development languages, you can easily find many good PHP books that can teach you to do awesome stuff in PHP, however it can not easily replace the power of a open source library. For most of the times, a problem is already solved by an existing library and you just need to know how to use it. When it comes to the functionality of PHP library, it actually follows an object oriented procedure or approach. These libraries can also be produced by you but you don’t have to reinvent apps every time you start working on a new program. Instead you can reuse already existing applications in form of PHP Libraries. 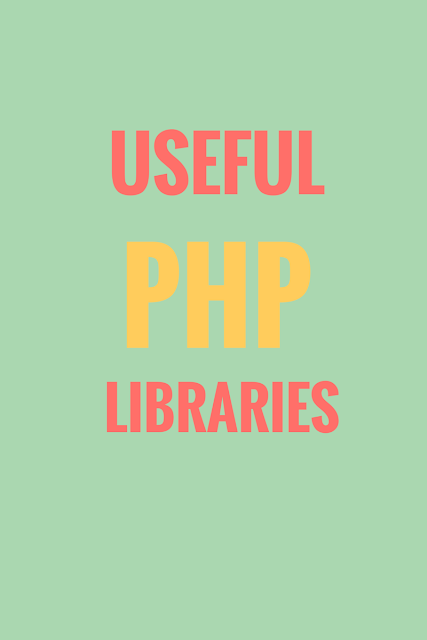 Below are some of highly useful PHP libraries that you can learn and use in your next project. Akismet is one of the best free services available to be used for small or large websites. The main function of the library is to compare comments with the existing database comments that are flagged spam. On the comparison, the system is able to decide if the comments are spam or not. ReCaptcha allows webmasters to integrate a highly effective CAPTCHA system in their website that prevent posting spam comments on the site by the spam bots. It includes both visual and audio captcha feature. pChart displays text data in apps with much better visual formats and this all is carried out with the help of variety of options such as bar graphs or pie charts etc. It is actually a kind of script which will enable you to generate graphs and charts from SQL queries and the back support from GD also increase its capability to create amazing images. Smarty used to be PHP Sub Project but now it is known as a smart template engine and it provides a lot of great features like caching system, variable, loops etc. Smarty library has been in use for a number of years and numerous versions have been released. XML-RPC allows webmasters to integrate the functionality of pinging to other website especially when the action of trackbacks is occurred. This particular action can be easily carried out when you use XML-RPC or other similar protocols. SimplePie is one more useful library which has covered some very useful actions and allows webmaster to work with syndicated content such as RSS feeds. When you use SimplePie, you will see that it has also covered variety of language sets and platforms. PHP-CPP library is basically a C++ library which is used by the developers to create PHP extensions. It brings a set of easy-to-utilize and very well documented classes. It is used to create PHP native extensions. Amazon brings an excellent workability in cloud that is known as S3 which is even used to store certain images found in different articles. If you are looking for a library which can allow you to upload even larger files without depending upon third party tools, you would love to use Amazon S3. PHPMailer is considered to be the most powerful library which allows the users to send their emails in variety of types from basic to rich texts and formats. Custom headers and attachments can also be included in those emails. Another application that is popularly used to send out emails from PHP Sites is SwiftMailer. The best thing about it is that it does not depend upon native PHP mail that consumes great resources, instead, it has the direct communication with MTA binary or SMTP server that enables it to send out mails efficiently and quickly. Mink is another great PHP library that allows you to test the proper interaction of web apps with browsers. It helps in eliminating API differences found between 2 different types of emulator browsers that enable you to get even better testing environment. Hoa is an extensible, modular and fully structured library set that has been designed with an aim to create a bridge between research and industrial worlds. Hoa recommends essential mechanisms, paradigms, algorithms etc. Geocoder is basically a PHP library that provides necessary technical support in creating geo-aware apps. Geocoding manipulation is supported by abstraction layer that is provided by Geocoder. Faker is a very helpful PHP library which helps you create fake data whenever you need it. It can do variety of things for you such as bootstrapping database, anonymizing data, stress test though persistence, creating XML docs etc. Requests for PHP are a well-established library which uses fsockopen or cURL to enable delivery of consistent API. It simplifies the process of making requests and accepts Patch, Delete, Put, Post, Get, Head etc. Ratchet helps the developers in creating bi-directional and real time apps between servers and clients over websockets. Ratchet helps in building and promoting event driven programs instead of creating the same old and traditional HTTP requests. Munee has been designed to deal with variety of things at the same time and it has been very helpful in manipulation and optimization of site assets. It has come up with a great caching feature which will allow you to cache created resources in client side as well as in server. PHP Thumb is a simple to use PHP library which will save lots of your time and hardworking by creating simple thumbnails with the use of just few code lines. It accepts all types of popular image types and formats. You can watermark, crop or rotate images and even quality of the images can also be easily defined. Opauth is an open source library which eliminates inconsistencies among providers and makes sure to introduce a standardized way to deal with all of them. At presently, there are three main plug-n-play providers including Facebook, Twitter and Google Plus. Ellen Charles is a professional web developer and an experienced tech writer who loves to write about unique topics related to technology. Right now she is busy with Best Essay Help where she has also contributed for a number of informative blogs and articles.